It’s that time of year again! The markets have started, Vegetables are rolling through our booths, a fresh batch of pigs just went in for slaughter so fresh cuts will be back at markets by Saturday Market and we are already calling down our lists to make sure vegetable products get moved and not fed to chickens as waste. And the bugs have already taken out a couple of beds so that the chickens and sheep both got vegetable treats. This last week we accomplished a fair bit. We have been starting scads of trays of various different kinds of winter squash (including 20 trays with 72 cells each of just Delicata squash!) and clearing out early beds of crops that were either done or eaten by bugs or bolted to seed because of the early heat so that we can start planting tomato starts in our large hoophouse. 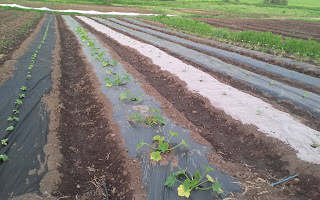 We also spent part of one afternoon laying about 3,500 feet of mulch paper for said winter squash. 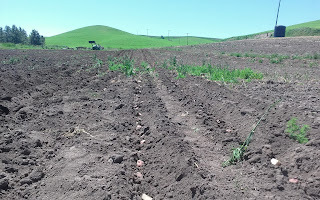 We were able to borrow a mulch layer for our tractor from the WSU Organic Farm to accomplish all of that footage in just about 4 hours, including frequent and frustrating fine-tuning. It was worth it! Laying mulch by hand takes a lot longer by hand and is hard on your back because you must shovel dirt all along the edge to hold the paper down or the wind will blow it away. 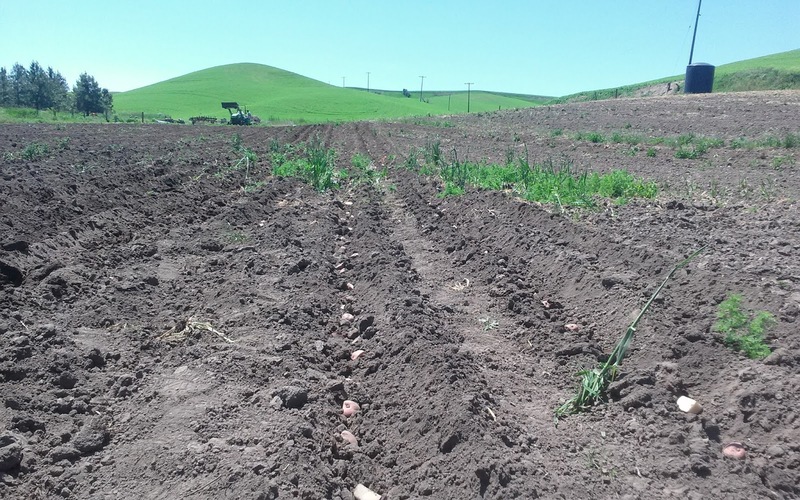 On Sunday, we had one employee and her fiancee as well as the Links of Link’d Hearts Ranch out in the afternoon to assist with cutting and planting potatoes. All together, not counting children who were busy climbing trees and hay bales, we had 9 people working on cutting, planting and tractor implement adjusting and tractor driving. In just 5 hours we were able to get all but 275 pounds of the 1000 pounds we purchased cut and into the ground. Jason and I and our Intern put in and finished the last 25 lbs that had been cut but not planted on Monday morning. Allow me to caveat all of that with the fact that there are millions of farmers in the world who are quite successful at farming and don’t have or want a tractor. They are most certainly REAL farmers! (There are a couple at the Moscow Farmer’s Market!) I am saying “Real” in quotes to emphasize the stereotypical idea that “real” farmers are only “real” when they use the tractor, or similar, for every aspect of their farm from planting to cultivating to harvest. Coming up this week is tons more transplanting! The list off the top of my brain includes tomatoes, peppers, onions, more kale, more chard, more bok choi, broccoli, cauliflower and many many more items. And the last of our potatoes. That will make nearly an acre of potatoes for this season! Definitely a new venture for us on this scale but it’s one that we don’t feel is adequately served in our area and we have the space such that we can put in an acre of potatoes without cramping our style on our CSA or having a full variety of vegetables at our Market booths. The other big change to look for this season is definitely going to be lots of vegetables at the markets. We have purchased two full booth spaces at both the Pullman Farmer’s Market as well as the Moscow Farmer’s Market and plan on filling all of that space with vegetables! Even if you didn’t purchase a CSA you’ll be able to pick up plenty of veggies from us also each week to go with eggs, lamb and pork. Financially for us, the vegetables are going to be much more important this season as we have been having some challenges finding land on which we are allowed to run batches of hogs. We are working on some options for our second and final batch of the 2016 season but are open to many ideas for land for the coming years if it’s not too far away from our current farm. As many of you may have heard, we had to move house this spring. The farm has not moved and doesn’t need to in the near future. We purchased a small mobile home in Pullman and have finally finished moving out of the farmhouse. Which means we can finally focus on getting caught up on farming! Our new house still feels like a storage unit with tons of boxes everywhere but each night we get another one or two unpacked and every night we are able to actually live in a little bit more of our space. Our longer-term plan is to live in our new place for four or five years while we save up some money and search for our Forever Farm. Ideally, somewhere in Whitman County, preferably in the Pullman School District but we will see what stands out to us as we get closer to being ready to actually purchase a place. This season, it will be tough and everything is in transition from what it was last season into the present in so many different ways and many things won’t and haven’t gone quite the way we’d wanted them to so far. On the other hand, things look bright. We are pretty well on track so far to at least squeak by, even if we end up needing to pick up some sort of job over the winter, we’ll do just fine.